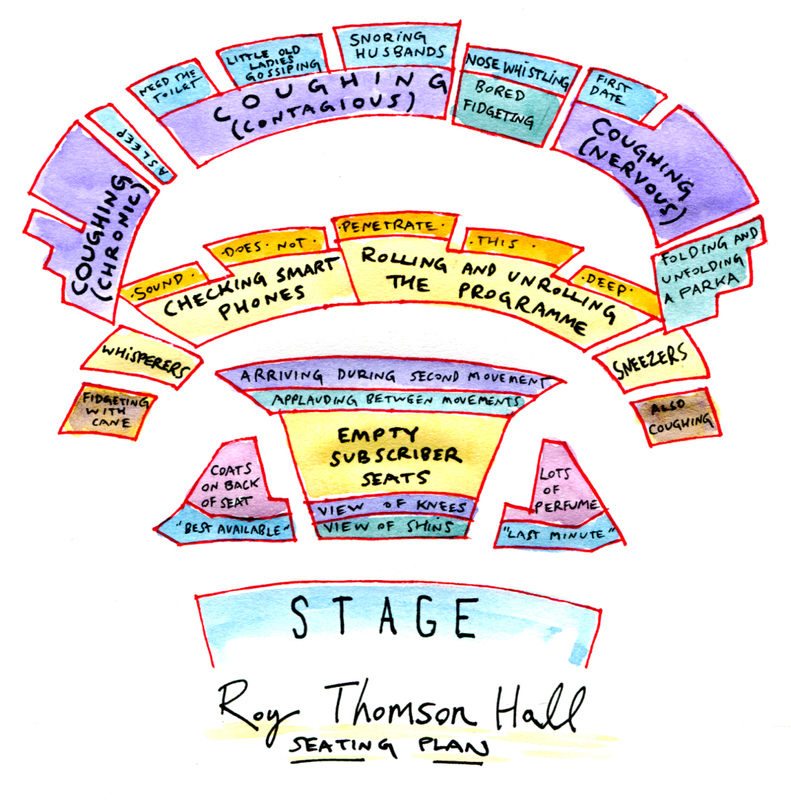 There’s a terrific blog post from Toronto based artist, blogger, and orchestra patron Rob Elliott (h/t Musical Toronto) who decided to sketch a new seating chart for Roy Thomson Hall, home of the Toronto Symphony Orchestra (TSO), after recently attending a TSO concert. With an approach that is perhaps best described as “truth in advertising” his blog post and sketch is fall-out-of-your-chair funny; especially for those who know all too well what Elliott is lamenting. The Toronto Symphony Orchestra is a great organization, with excellent players and a bold programming…TSO audiences, on the other hand, leave something to be desired. Every time I attend the symphony, I fear my brain is going to explode before the concert is over. Which halls do you think deserve updated seating maps and why? The National Symphony Orchestra at the Kennedy Center needs a similar chart. What seems more bizarre is that people actually pay money (really good money sometimes) to do these things. But seriously, I think it’s what the classical music experience is all about. Just as we’re looking for the reward at the end of an hour-long buildup – the lesson is that patience pays off. The big moments must be earned, otherwise, they don’t really mean as much. Working to find whatever connects us with that 200 year old composer is also worth the effort. Maybe the public doesn’t understand what they’re hearing sometimes, or they aren’t having the emotional experience they were expecting to have. It’s easy in today’s culture to give up – turn something off, try a different exhibit, walk out of a movie – but in a traditional classical concert, you really have to wait until the end of the piece and hear the composer out. Some people may find that difficult. Sometimes there’s that moment in a work where there is a spiritual connection, a moment of healing – the point at which everything else, including that one wrong note, and whatever the public brings with them, doesn’t matter. If noise is loud enough, it might interfere – but we do have the ability to tune certain things out. It’s sort of nice to let the guard down in public too – because seeing how others react can be contagious. What’s special is that people are bringing their character and troubles to the table – and musicians for a little while have an opportunity to transform them.